1. Now the Lord had prepared a great fish to swallow up Jonah. LXX: And the Lord ordered a great fish to swallow Jonah. The Lord commanded death and the underworld to receive the prophet. To the eager jaws of death he seemed a prey: she had such joy in swallowing him, and such sadness in spitting him out. Thus happened what is written in Hosea: "I will be your death, O Death! I will be your bite, Hell!". In the Hebrew we read "a great fish", which the Septuagint and the Lord in the Gospel call a whale, to explain the matter in short. For the Hebrew says dag gadol that we translate as 'a big fish'. Evidently this means a whale. We must note too that where he awaited death, he found his salvation. And when it says, "he had prepared", this is even right at the beginning of creation, the animal which is mentioned in the psalm: "this dragon which you have created to play with him". Or even he makes a fish come near to the ship to take in its belly Jonah who has been thrown over board, and to provide his rescue not his death. So he who felt the wrath of God in the boat was to feel his benevolence in his death. LXX: And Jonah was in the belly of the whale for three days and three nights. The Lord shows in the Gospel the symbolism of this passage, and it is superfluous to say in the same terms or even in other terms what he who has suffered has already said. But we ask ourselves this: how was he three days and three nights in the belly of the earth. Some scholars take the view according to paraskeuen, because of the solar eclipse from the sixth to the ninth hour when night followed day, this would be two days and nights, and adding the Sabbath, believe that we should count this as three days and three nights. But I prefer to understand this by reason of synecdoche, seeing the whole as a part: where he is dead in paraskeuen, let us count one day and one night; two with the Sabbath; the third night which arises from the day of the Lord, let us take that as the beginning of the next day, for, in Genesis the night is not of the preceding day, but of the following day, that is to say the beginning of the next day, not the end of the previous. To understand this better I will say it more simply: if a man leaves his house at nine and the next day he arrives at his other house at three. And if I say that he has been two days in travelling, I will not be reprimanded as a liar, because he has not used all the hours of two days, but only a part for his journey. Nonetheless this seems to me to be the interpretation. If someone does not agree with this, and he can explain the meaning in a clearer way, then we should follow his interpretation. 2. Then Jonah prayed unto the Lord his God out of the fish's belly. If Jonah is compared to the Lord, and his time of three days and three nights in the belly of the whale is a sign of the suffering of the Saviour, his prayer also ought to be a kind of prayer of the Saviour. Some people, I don't doubt, will find it difficult to believe that a man can spend three days and three nights in the belly of a whale, especially after a shipwreck. These people can either be religious or not. But if they have faith, they will believe this all the more: how three children thrown into a furnace of hot fire were so well protected that their clothes were not even singed; how the sea drew back on itself into two sides and held itself up like a wall to offer a route for the people who wanted to pass; how with all human moderation the anger of a lion that had been increased by hunger was taken by fear at the sight of his prey, and didn't want to touch it; and even other such miracles. If they do not have faith, let them read the fifteen books of Ovid's Metamorphoses, and all Greek and Latin history. Therein they will see Daphne changed into a bay-tree, or the sister of Phaeton changed into poplars; how Jupiter the highest god, was transformed into a swan, flowed in gold and became a raging bull, and other adventures where the ugliness of the stories attest the holiness of the divinity. They believe in these stories and say that everything is possible for one god. And while they believe these ugly stories and defend the absolute power of a god, they do not attribute this same power to honest deeds. With regard to these words: 'then Jonah prayed to the Lord his God out of the belly of the fish and said…' we understand that feeling that he is safe in the belly of the whale he does not despair of divine mercy and concentrates wholly on praying. For God, who had said, "I am with him in his distress", and when he calls to me, I will reply, "I am here. ", came to his aid and he whose prayer had been answered was then able to say, "in distress you have made me greater". 3. And said, "I cried by reason of mine affliction unto the Lord, and he heard me; out of the belly of hell cried I, and you heard my voice." LXX: Similar except: "From the belly of hades I threw out my cries." He does not say, "I cry", but "I cried". He does not pray for the future, but gives thanks for the past. That shows us that from the moment he is thrown into the sea and sees the whale, that great bulk, that immense mouth which opened wide to swallow him, he remembered God and cried out, either by the waves giving passage for his cry, or by a feeling from the depths of his heart, according to that which the apostle says: "crying in your hearts": "Abba! Father". He cried to him who alone knew the hearts of men and said to Moses, "why do you cry out to me? ", while the Scriptures remember that Moses had never cried out before this speech. This is the text that we read in the first psalm of the steps: "I cried to the Lord in my distress and he replied to me." By the "belly of hell" we understand the stomach of a whale of such great size that it took the place of hell. But this can better be referred to the person of Christ, who under the name of David, sings in the psalm: "you will not leave my spirit in hell, and you will not allow your saint to see putrefaction", living in hell free among the dead. 4. "For you had cast me into the deep, in the midst of the seas; and the floods compassed me about." LXX: "You cast me into the deep of the heart from the sea, and the waves surrounded me." The interpretation of the person of Jonah is not difficult: from the moment when he was closed in the stomach of the whale and found himself at the deepest and middle of the sea, he was surrounded by waves. For the Lord, the Saviour, prefiguring psalm 68 in which he says, "I am enshrouded in the deep mud where there is no ground. I have come to the deepest part of the sea and the storm engulfs me". It is said of him in another psalm: "but you, you have rejected, despised and disquieted your Christ; you have cursed the covenant of your master, you have dishonoured his sacred place on earth, you have destroyed all its walls", and so on. For in this comparison of divine blessing and that place about which is written, "his home is in sacred peace", all habitation on earth is full of waves, full of storms. And the "heart of the sea" means hell, for which we read in the Gospel, "in the heart of the earth". For just as the heart is at the middle of animal, so we say that hell is in the middle of the earth. Or according to anagoge he recalls that he is "in the heart of the sea", that is in the middle of temptations. However, although he has been among the bitter waters and been tempted by all things without sin, he has not felt the bitter waters, but has been surrounded by the waves about which we read elsewhere, "an impetuous wave rejoices in the city of God". Others drank the salty waves; myself, surrounded by temptation, I endured sweeter currents. And do not think what the Lord says now is impious: "you have cast me into the deep", who says in the psalm, "for they have followed him that you smote", according to the phrase which in Zechariah is spoken by the Father: "I will smite the shepherd, and the flocks will be scattered". "All thy billows and thy waves passed over me." LXX: "All your whirlwinds and your waves passed over me." No one can doubt that the swelling waves of the sea encompassed Jonah, that there was fierce thunder in the storm. But we ask how all the whirlwinds, billows and the waves of God encompassed the Saviour. "The life of men on earth is temptation", or as there is in the Hebrew, "a military service", for we serve here to be crowned elsewhere. There is no man who can sustain all the temptations, except him who has been tempted by all, in our image, except sin. This is why it is said in Corinthians, "no temptation will take you, I hope, unless it is human. God is faithful, he will not let you try beyond your ability, but he will produce an exit that you may hold on to." And like all persecutions and all wicked things that happen to us they do not happen without the will of God, we speak of whirlwinds and waves of God, which have not crushed Jesus, but have come down upon him with a simple threat of shipwreck which does not happen. Thus all persecutions and whirlwinds which tortured mankind and broke all the ships have passed thundering on my head. And myself, I have sustained storms and broken whirlwinds which were raging, to allow others to sail more easily. 5. Then I said, "I am cast out of thy sight;"
LXX: I said, "I am cast far from your sight." Before I cried out from the depths of my distress and before you heard me, me who had taken the position of slave and imitated its weakness, I said, "I am cast out of your sight". When I was with you enjoying your light and you, light, being light, I did not say "I am cast out". But once at the bottom of the sea and surrounded by the flesh of a man, I say: "I am cast out of your sight". I said this as a man. And as God being in that condition I did not think of my equality with you, because I wanted to raise mankind to you, so that wherever I am with you they are there as well and those who have believed in me and in you, I say: yet I will look again toward thy holy temple. LXX: 'do you not think I will be able to see your holy temple again?'. To express the Greek ara, the Vulgate edition's 'do you think' can be interpreted as 'therefore', like the last conclusion of the proposition, of the assumption and of the confirmation and syllogism, not in the uncertainty of someone who hesitates but in the confidence of someone who affirms. This has been translated by, "yet I will look again on your holy temple", according to that which is said in another psalm by the spokesperson of Christ: "Lord, I have loved beauty of your house and the tabernacle where your glory lives", and the passage of the Gospel in which it says, "Father, glorify me with you by that glory which I had before the world existed". And the Father replied to heaven: "I have glorified him, and I shall glorify him". Or even because he says, "the Father is in me, and I am in Him", for the temple of the Father is the Son, thus the temple of the Son is the Father. He Himself said, "I left my Father and have come", and "the word was with God and the word was God". Or even the Saviour, the one and the same, asks as man and promises as God, and he is sure of the right that was always his. For the person of Jonah you can clearly see that with a feeling of desire and confidence, at the bottom of the sea, he wished to see the temple of the Lord, and with a prophetic spirit he found himself elsewhere and thought of other things. 6. "The waters compassed me about, even to the soul: the depth closed me round about,"
LXX: "The water ran about me up to my spirit; the last depth closed around me." These waters, near to the deep, which cycle and slide about the earth, which drag much mud with them, tend to kill not the body but the soul, for they are friendly to the body and warmed by its desires. This is why, according to that which I have said above, the Lord says in the psalm, "save me, Lord, because the waters have penetrated even to my soul", and in another passage, "my soul has passed a torrent", and, "let not the well press its mouth on me", let hell not imprison me! Let it not refuse me an exit! I freely made the descent; so let me make the ascent back again freely. I became a captive voluntarily, I ought to free the captives so that this verse is fulfilled: "ascending into the higher parts he led the captives". For those who were beforehand captives in death, he brought them to life again. We must heed certain wicked forces in the deep, or the specific powers in torture and supplication; demons, in the Gospel, ask not to be forced to go to them. This is why "the darkness was over the deep". Sometimes the deep is taken to mean the sacraments in a deeper sense, the judgements of God: "the judgements of the Lord are a great abyss", and "the deep cries out to the deep in a cry of your cataracts." 6b-7. "the weeds were wrapped about my head. I went down to the bottoms of the mountains; the earth with her bars was about me for ever:"
LXX: "My head has penetrated to the base of mountains; I descended to into the earth whose bars are eternal bonds." No one doubts that the ocean covered Jonah's head, that he went down to the roots of mountains and came to the depths of the earth by which as bars and columns by the will of God the earthly sphere is supported. This earth about which is said elsewhere, "I consolidated her columns". With regard to the Lord Saviour, according to the two editions, this seems to me to be what is meant. His heart and his head, that is the spirit that he thought worthy to take with a body for our safety, went down to the base of the mountains which were covered by waves; they were restrained by the will of God, the deep covered them, they were parted by the majesty of God. His spirit then went down into hell, into those places to which in the last of the mud, the spirits of sinners were held, so too the psalmist says: "they will go down to the depths of the earth, they will be the lot of wolves". These are the bars of the earth and like the locks of a final prison and tortures, which do not let the captive spirits out of hell. This is why the Septuagint has translated this is a pertinent way: "eternal bonds", that is, wanting to keep in all those whom it had once captured. But our Lord, about which we read these lines of Cyrus in Isaiah: "I will break the bronze bars, I will crack the iron bars", He went down to the roots of the mountains, and was enclosed by eternal bars to free all the prisoners. "yet have you brought up my life from corruption, O Lord my God." LXX: "And from corruption my life comes up to me, O Lord my God." He says rightly "you have brought up" or "let my life come up from corruption", because it had descended to corruption in hell. This is what the apostles interpret in the fifteenth psalm as prophetic speech of the Lord: "for you will not leave my spirit in hell, and you will not permit your holiness to see the corruption", given that David is dead and has been buried, but the Saviour's flesh has not known corruption. Others understand that compared to celestial blessing and to the Word of God the body of man is corruption itself, for "it is sown in corruption", and in the psalm one hundred and two, the meaning is applied to a righteous man: "he who cures all illnesses, who has brought his life back from death". This is why the Apostle says, "O wicked man that I am! Who will deliver me from this body of death?". It is called "the body of death", or "body of misery". These people take the text in the sense of their heresy, to see an Antichrist in the place of Christ, and to take the Churches in order to feed a fat stomach and discuss contrary to the flesh living in the flesh. But we, we know that the body taken from the pure Virgin was not the corruption of Christ, but his temple. If we pass then to the thought of the Apostle in Corinthians, where there is the question of a spiritual body, we would say, in removing any appearance of chicanery, that the same body, the same flesh rises again, which has been buried and placed in the soil; but the only thing that changes is the glory, not nature. "for this corruptible being must cover incorruptibility, this mortal being must clothe immortality." When he says "this being" it is almost as if one showed the body by pinching it between two fingers: in which we are born, in which we die, that those who are guilty fear to receive as punishment, that virginity awaits in recompense, that the adulterer fears in punishment. 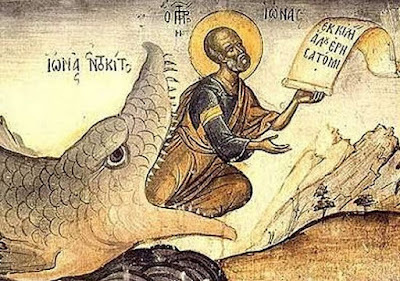 For Jonah, this is how we can understand it: he who would have had to corrupt himself physiologically in the belly of the whale, and get by on the food of beasts and survive by drinking from the veins and arteries, still managed to remain safe and sound. And when he says, "Lord my God", this is a feeling of flattery: he thinks that God, who is common to all, is also common to him, and feels he is his own because of the greatness of his benevolence. 8. "When my soul fainted within me I remembered the Lord." LXX: "When my spirit failed in me, I remembered the Lord." Although I hoped for no aid, he says, the memory of the Lord saved me, according to this passage: "I remembered the Lord and I rejoiced", and in another passage, "I remembered former days and I remembered the days of eternity". I had lost all hope of finding a way out: my body was so frail in the intestines of the whale that I could not hope for my life. And so, everything that seemed impossible I found to be surpassed by the thought of the Lord. I saw myself imprisoned in the intestines of the whale, and all my hope was the Lord. From this we can learn that, according to the Septuagint, at the time when our spirit fails us, it is wrenched from its union with the body, and we ought not to turn our thoughts from Him who inside and outside our body is the Lord. For the Saviour the interpretation is not very difficult because he said, "my spirit is sad to die", and "My Father, if it is possible let this cup pass me by", and, "I place my spirit in your hands", and other passages which are similar to this. And my prayer came in unto you, into thine holy temple. LXX: similar. In my distress I remembered the Lord so and my prayer came in to heaven from the depths of the sea and from the roots of the mountains, and came to your holy temple where you reside in eternal beatitude. This new kind of speech should be noted here: a prayer made for a prayer. Jonah asks that his prayer rise up to the temple of God. He wishes like the Pope that in his body the people should be freed. 9. "They that observe lying vanities forsake their own mercy." LXX: "Those that keep mistaken vanities lose their mercy." By nature God is merciful and ready by his mildness to save those whom he can't save by justice. But because of our vices we lose the mercy which is reserved for us and is offered to us. Jonah did not say, "those who make vanities", for "vanity of vanities, all is vanity", not to have an air of condemning everyone, and of refusing mercy to all mankind, but "those who keep vanities" or the lie "those who have come to love their heart", who are not happy with doing, but who keep their vanities as if they cherished them, thinking they have found some kind of treasure. Note too the greatness of the prophet's spirit: at the bottom of the sea, surrounded by an eternal night in the intestines of a great beast he is not thoughtful of his danger, but philosophises on the question of nature. "they will lose" he says "their mercy". Although mercy is offended and we can understand that it is God Himself: for "God is merciful and good, patient and full of pity", yet mercy does not abandon those who keep their vanities, she does not curse them, but waits for them to return, while they intentionally abandon the mercy which is before them, offered to them. This can also be prophesised for the Lord on the subject of the infidelity of the Jews, who think themselves to observe the precepts of mankind and the commandments of the Pharisees, this is vanity and a lie, and they have abandoned God who always had pity for them. 10. "But I will sacrifice unto you with the voice of thanksgiving; I will pay that that I have vowed. Salvation is of the Lord. LXX: "But I will sacrifice to you with the voice of praise and the action of thanksgiving. I will pay all that I have vowed to you, Lord, in salutation." Those who keep their vanities have abandoned their mercy. But I who have been eaten for the sake of the safety of the multitude, will offer you sacrifices with the voice of praise and thanksgiving, offering myself. For "Christ, our Easter, has been sacrificed". A as a true Pope and lamb he offers himself for us. And I will give thanks to you, saying, "I bless you Father, lord of heaven and earth", and I will keep those vows to the Lord that I made for the safety of others, so that all that " you have given me never dies". We see what the Lord promised in his suffering for our safety: let us not make Jesus a liar, and let us be pure, delivered from all the uncleanness of sins so that he offers us to God the Father as the victims he had promised. 11. And the Lord spoke unto the fish, and it vomited out Jonah upon the dry land. LXX: "And he ordered the whale to vomit Jonah out onto the dry land." That which we read above as being about Jonah, the Lord prayed for in the stomach of the whale about which Job speaks in an unclear way: "let he who curses this day curse him, he who will capture the great whale". The great whale, the deep and hell are then ordered to give back the Lord to the dry earth; thus he who had died to free those detained by the chains of death, can lead with him many others towards life. With regard to the expression 'vomited' we must take this to be said in a very emphatic way, to mean that triumphant life has emerged from the deepest and most impenetrable parts of death. Jn. 10:38; 14:10, 11; 17:21. Mt. 8:30; Mk. 5:10; Lk. 8:31.